David H. Koch, the left’s favorite low-hanging fruit, is the subject of Hans Haacke’s latest jeremiad on the state of institutional culture, an installation called “The Business Behind Art Knows the Art of the Koch Brothers” (2014), which takes aim at the Metropolitan Museum of Art’s newly unveiled and much-pilloried David H. Koch Plaza. Koch has now left his mark on the East Side, at the Met, and the West Side, where Lincoln Center’s former New York State Theater, which the New York City Ballet calls home, is named after him as well. What gives? The boards of these institutions are no doubt aware of the fear and loathing that the Koch name (which includes David’s brother Charles) provokes in the creative community. The Met originally announced that the plaza — financed by Koch to the tune of $65 million — would remain unnamed, which felt like a backdoor accommodation to those sensitivities. Why the reversal in the face of certain opposition? Did $65 million — or, more likely, the possibility of wooing millions more — speak that loudly? 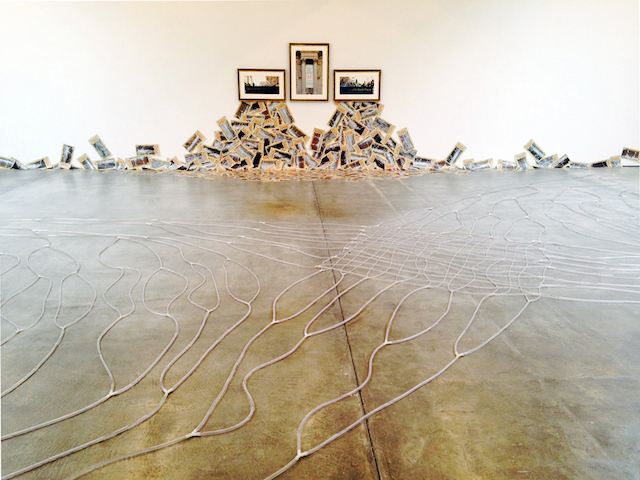 The subterranean channels connecting art, wealth, and power are exactly what Hans Haacke has been all over for the past four or five decades. Now that the corruption of the electoral process by the Supreme Court’s Citizens United decision is complete, along with, as of last week, the subsequent right-wing takeover of the federal government, maybe we’re ready to listen. 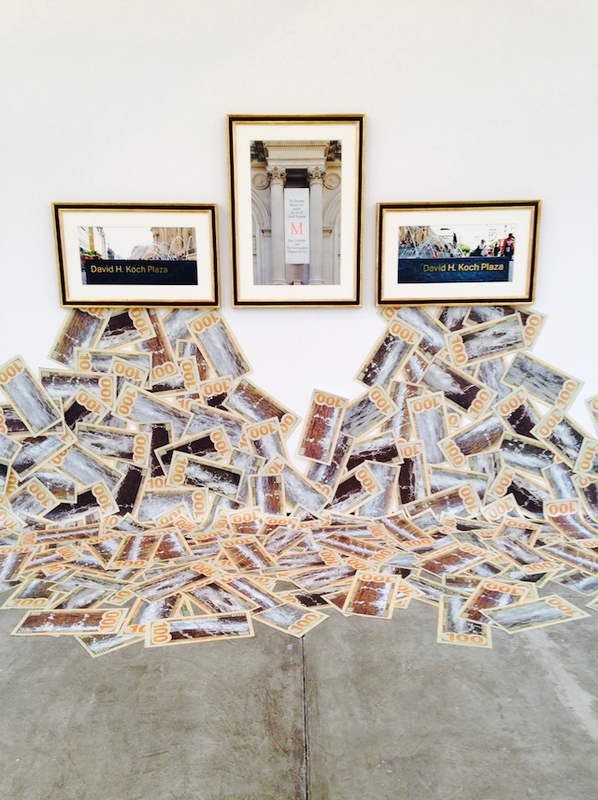 Hans Haacke, installation view, detail: “The Business Behind Art Knows the Art of the Koch Brothers” (2014); C-print; overall triptych framed: 37 x 99 1/2 x 1 3/8 in. ; photo-collaged hundred dollar bills, each: 8 x 16 1/2 in. ; overall installation dimensions variable; edition 1 of 1, 1 AP. Many public relations opportunities are available through the sponsorship of programs, special exhibitions and services. These can often provide a creative and cost effective answer to a specific marketing objective, particularly where international, governmental or consumer relations may be a fundamental concern. The Metropolitan Museum of Art. Perhaps he’s taking the long view. As I passed through the exit at the conclusion of the Met’s marvelous exhibition, Cubism: The Leonard A. Lauder Collection, there was a not-inconspicuous brass wall plaque announcing that I had entered the Henry R. Kravis wing of the museum, trading the beneficence of one tycoon for another, as it were. How many of us know, though, just who Henry Kravis is — the original Gordon Gekko-era leveraged buyout king as well as, of late, a strong supporter of the presidential ambitions of George W. Bush and John McCain? As the Bloomberg News magazine Bloomberg Markets observed in an otherwise laudatory article published on Kravis’s company, KKR, in August 2007, “when KKR pulls the levers, someone usually gets ground up in the gears”: companies are bought and then resold at a profit after workers are laid off and benefits greatly reduced. Will Koch’s name on the fountains lull us into mitigating or forgetting his record as easily as we have forgotten Kravis’s, or for that matter, the unsavory episodes in the lives of Andrew Carnegie, Henry Clay Frick, J.P. Morgan, John D. Rockefeller, and Henry Ford? And we may ask further, is it possible to imagine a future without the infernal copulation of art and power? Haacke — as even a cursory reading of his oeuvre would tell you — would say no. 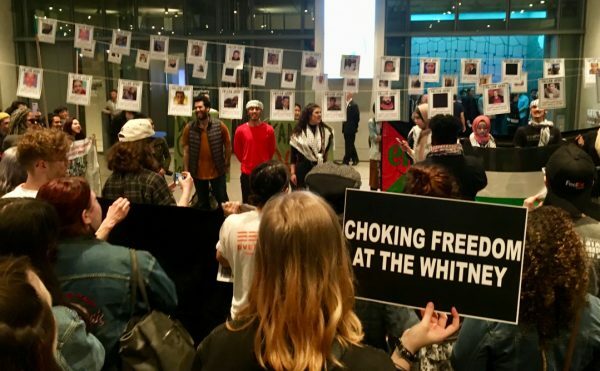 What makes the Met’s move particularly offensive, obviously, is the blind eye it turns toward Koch’s universally publicized and unstoppable efforts in support of climate change denial, actions that should be an affront to every well-informed citizen. But why not the Met’s board? The rich are different, F. Scott Fitzgerald said, and mind-boggling decisions such as this one tell us just how different they are. And yet even among the rich, only the really big fish — those who have true power over our lives — wield the kind of clout it takes to put their names on a museum. I’ve always been interested in systems and how they work, and at a certain point you understand that political and social systems are part of that, too, that they can’t be escaped. The system about which Haacke has become a world expert is the art/money/power nexus, whose rotating casts of rogues and fools — including such demagogues as Jesse Helms, Margaret Thatcher, and Ronald Reagan — no longer elicit, as the decades pass, the kind of vehemence they once did, especially for young artists who, inspired by Occupy Museums or the Gulf Ultra Luxury Front, may or may not know they are following in Haacke’s footsteps. But, at bottom, it doesn’t matter how much potency these political figureheads retain. The faded emotions stirred by their appearance in Haacke’s past works — that is to say, the transitory nature of the artist’s targets — only confirms the intransigence of the system: a villain with a thousand faces going back to the popes and Medicis in our Western tradition, but also playing out, chameleon-like, in innumerable forms, worldwide, throughout ancient and modern history. The most trenchant piece of Haacke’s quote from the Times profile is that political and social systems “can’t be escaped.” It’s a viewpoint that blurs fatalism with realism, reminding us that we are all part of one system or another, and that we don’t make the rules. But Haacke’s art, especially the work shown in tandem with “The Business Behind Art Knows the Art of the Koch Brothers” in the artist’s current solo turn at the Paula Cooper Gallery, refuses to be mired in resignation or defeat, revealing instead the vitality and beauty, as well as the menace and brutality, inherent in all systems. Haacke’s functional-abstract sculpture, “Together,” first made in 1969, covers the floor of the main gallery, with electric motors pumping water through lengths of intersecting plastic tubes. It’s like an X-ray of an underground spring or a large-scale section of the circulatory system — the point being that any and all such associations apply. What is especially arresting about the tubing is how smoothly it adjoins the water imagery in the Koch satire (the churning surf printed on the $100 bills; the water jets of the fountains) so that it becomes, forty-five years after its initial fabrication, an allusion both to the fountains’ plumbing and to the potentially irreversible environmental degradation that will occur once the brothers finally have their way. 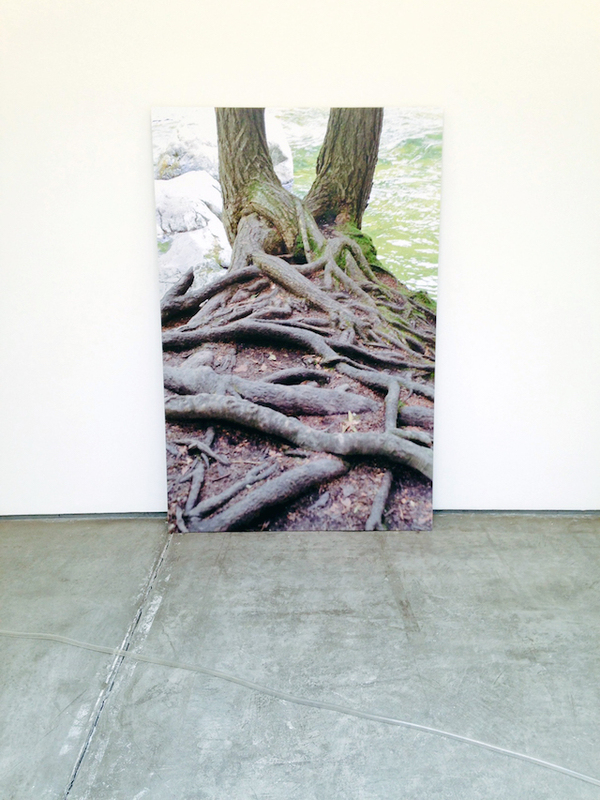 There is also a set of large-scale nature photographs — ripples in a pond, a network of tree roots echoing the tubular patterns of “Together” — that lean against or hang from the walls. These also feel as if they are part of the same concept, though they are each independently titled and one, “Live Airborne Systems,” which captures the image of a flock of seagulls converging on bits of bread tossed on the surface of the water, is from 1968, while the others were made this year. Hans Haacke, “Growing Up Together” (2014). UV matte laminated color inkjet photo mounted on aluminum; 44 x 66 x 1 in. Edition 1 of 3; 1 AP. The forever-ness of Haacke’s systems, with their tangled implications for the past, present, and future, offer a perspective that perhaps, paradoxically, can provide us with a sense of relief, even solace, as we accept their inevitability. We may be bound up in inextricable networks, but we need not be blind to their machinations or consequences. It’s a recognition that affords a modicum of control, and in that control, the potential for developing a personal moral code to navigate the systems that rule our lives. And within the comfort level established by that code, we can make the choice of how much an observer and how much a player we intend to be. Haacke, for one, is a player. This show is at Paula Cooper after all, not an artist-run alternative space. His work is in the collections of major museums and has made the rounds on the biennial circuit, and he was the surprise choice for the 2015 Fourth Plinth commission, which funds a public sculpture for the sole unoccupied plinth in London’s Trafalgar Square. 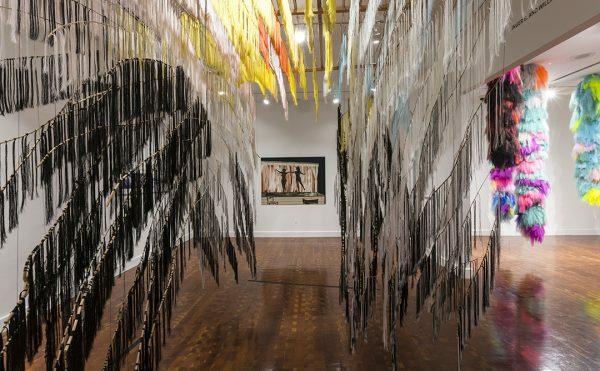 His apparently split art-world identity between member and opposer is better understood if his work is viewed not as institutional critique, though it contains a heavy dollop of that, but rather as a dissection of society’s deep-set use and abuse of art and culture. Haacke’s voice is consistent but his methods are not, which undercuts his work’s appeal in an art market that thrives on recognizable hooks. The form taken by each project is driven by its content and concept, be it installation, sculpture, text, photography and/or painting. Despite his work’s resistance to the market, he has maintained a presence on the international scene that allows him to turn the means of cultural production and distribution against themselves, often audaciously: in 1988, his public installation in the town of Graz, Austria, “And You Were Victorious After All,” a monumental reminder of the celebrations the town threw to welcome the Anschluss, was firebombed by a Neo-Nazi; and in 1993 he jackhammered the floor of the German Pavilion of the Venice Biennale to draw attention to the building’s 1938 redesign, which was executed by the architect Ernst Haiger on the orders of Adolf Hitler. The essence of Haacke’s works is a denial of denial: they force us to recognize the low ends that can be made of the loftiest means. For those of us who have ascribed to art the qualities formerly reserved for the sacred, he discomfits our perspective with hard secular facts, illuminating the impurities commingling with transcendence. And among the most self-evident of those facts is that the bastards who run the place, from the aforementioned popes and Medicis onward, have been integral to the societal and economic structures that accommodate, in one way or another, the artworks that define our humanity. 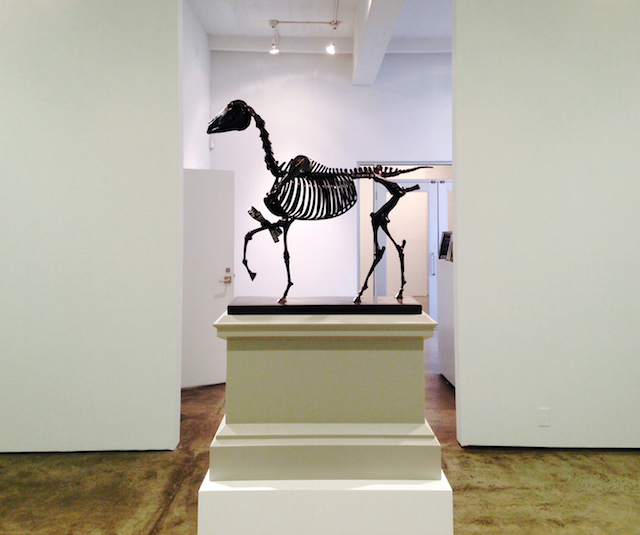 “Gift Horse” (2013), Haacke’s winning entry for the Fourth Plinth commission, is on display in the smaller of the gallery’s two rooms, in the form of a bronze maquette accompanied by parts of a horse skeleton, photographs of the work in progress, and the cast of a foreleg from the sculpture’s to-scale plaster model. The final version of “Gift Horse” will be a mockery of imperial equestrian statuary, a monumental skeleton of a horse based on an etching from a group of thirty published under the title “The Anatomy of the Horse” in 1766 by the 18th-century English animal painter George Stubbs. Hans Haacke, “Gift Horse, Model for Fourth Plinth, Trafalgar Square, London” (2013). Bronze and electroluminescent film; sculpture: 18 1/8 x 16 x 6 1/4 in. ; plinth: 13 x 8 1/2 x 18 in. ; overall: 30 1/2 x 8 1/2 x 18 in. Edition 2 of 6; 1 AP. Fabricated by Julia and Shane Stratton. According to a wall text provided by the artist, 1766 was the year Adam Smith began writing The Wealth of Nations, which “introduced an often cited and perhaps misunderstood ‘invisible hand of the market’ as the source of the common welfare.” Haacke references the wealth of nations by means of an electronic “ribbon” tied to a front leg of his gift horse, which will continuously transmit the FTSE 100 ticker — the stock price of the highest-rated companies on the London Stock Exchange. The invisible hand of the market is currently fetishized (along with the Americanized — and Disney-fied — “magic of the marketplace”) as a metaphor of a self-correcting economy with the ability to supply goods and services safely and efficiently to those who need (i.e., can afford) them without the intrusion of governmental regulations. That’s nonsense, of course, and the art market, as the efflorescence of capitalism, is rife with the value distortions and fallacious assumptions of those who control the economy. And there has been a spillover of those distortions into the institutions that are implicitly charged with containing and tempering them, as witnessed by the Museum of Modern Art’s transformation into a Sub-Zero corporate refrigerator; the Whitney’s Jeff Koons retrospective and subsequent abandonment of its exquisitely human-scaled Marcel Breuer building; and the David H. Koch Plaza at the Met. However much we may crave simplicity in our lives, systems wouldn’t be systems without a nearly impenetrable degree of complexity and nuance. 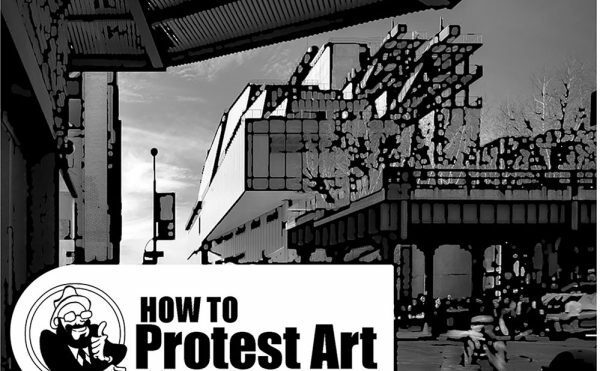 The works of beauty and aggression we mount as challenges to the wall of power in art and politics are necessarily a part of this complexity, not from the moment of their cooptation, but from their very inception. Haacke, who was born in 1936 in Cologne, Germany, which was pounded to rubble in World War II, and who came to the U.S. amid the rebellions and assassinations of the 1960s, has a unique personal perspective on the invisible hand, not of the market, but of history, and his life’s work has become a testament to the improbabilities of fate. The Berlin Wall, the last vestige of the war, fell twenty-five years ago this week, and perhaps in twenty-five years, David Koch’s tentacular hold on power will be equally diminished, just as Lehman Brothers — the once-invincible financial powerhouse headed for decades by Robert Lehman, whose collection is housed in the Met’s unlovely and unloved Lehman Wing — is no more. The plaza that bears Koch’s name is as embedded in intractable, uncontrollable crosscurrents as Lehman’s firm, and the most remorseless element of any system is time. Hans Haacke continues at the Paula Cooper Gallery (521 W 21st Street, Chelsea, Manhattan) through December 13.